Welcome to the 2nd half!!! First part of the season? OVER! Time to start a new. And we did! Kazmir went head to head vs. the legendary Roger "The Rocket" Clemens, and won! I’m sure it was a real thrill for Kaz to beat one of his childhood idols. And boy, if there’s anything I’m happy about, it’s coming back from 12 days on the road and playing 4 games vs the Yankees and their lovely fans. Why was I on the raod for so long? Well from June 29-July 1 I was in Orlando participating in the Celebrity mascot games. I had a great time hanging with my buddy Staley from the Chicago Bears and Stormy from the Carolina Hurricanes. We had a fun time. It’s like they say "There ain’t no party like a mascot party!" I don’t know who "they" is or why "they" said that, but chances are, "they" were a mascot. After Orlando, I went back to Tampa to pack for my next trip, Boston! I sat back and enjoyed the first two games. It was great getting to watch my Rays battle the Sox at Fenway on the fourth of July. Wish we could have won! On July 5th I made my Fenway debut. Wally was up on the dugout tossing out balls. I came up on the dugout, took away his bag, and generally taunted the Red Sox faithful. Of course Wally got me back by tearing off my fur. That seems to keep happening every time I visit another stadium. Jerry Remy thought it was funny. Yeah, keep laughing RemDawg. I’ve got plenty in store for you and your precious Wally when you guys come to town July 27! After Boston, ALL STAR GAME! I jetted out directly to lovely San Francisco! It’s a treat! I was on the ground for only an hour before I was rushed off to the DHL Fan Fest. 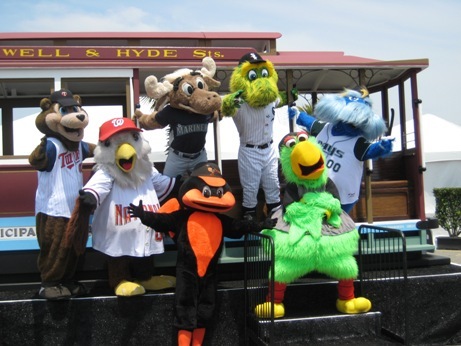 I competed in the mascot home run derby, but Bernie Brewer won from our group and TC from Minnesota won the whole thing. We did a skit for the home run derby, and even got a great group shot in the middle of the outfield at AT&T park. Watching the game was a real thrill. Seeing them honor Willie Mays, the giant flag in the out field, the flyover, Ichiro’s inside the park homer, CC’s homer, and watching the NL go out swinging, with bases loaded, down one run, in the 9th. American League dominates! At the All Star game, we mascots got together to honor a true legend, Dan Kilday. Dan’s retiring from the MLB after 17 years. He’s been a great friend to all of the MLB mascots, and foe to all rookies. Bus rides just won’t be the same! Heeeeeeeeyyyyyyyyyy! I’m from Chicago but vactioned in Florida last week and went to a pair od D-Rays games. I just wanted to say that skit with you and Wally taking out the Yankee fan was hilarious. I think you are a great mascot and my girlfriend fell in love with you so much that I went out and got here a lil’ Raymond doll. You Rock…Keep up the good work. Even though I back in Chicago now, I always watch the Rays on MLB Extra Innings so I’ll be looking for you.